■ Little League World Series. ■ ABC broadcasts the Little League World Series championship game for the first time. ■ Little League opens its first regional headquarters in St. Petersburg, Fla.
■ Howard J. Lamade Memorial Field is renovated with new concrete stands and is renamed Howard J. Lamade Stadium. Seating capacity would later increase to 10,000 in 1971. ■ Little League Baseball revises its rules to allow girls to participate, following the New Jersey Supreme Court’s order allowing girls onto Little League teams in that state. Little League Softball was created the same year. ■ The Peter J. McGovern Little League Museum opens at Little League’s headquarters. ■ ABC carries the Little League World Series championship game live for the first time. A miniature camera is mounted on the mask of the home plate umpire, a broadcast first. ■ Little League Baseball creates the Challenger Division for mentally and physically disabled children. ■ Little League Baseball celebrates its 50th anniversary. ■ The first Little League Baseball World Series night game is played after the installation of a lighting system at Howard J. Lamade Stadium. 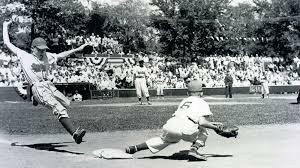 ■ Little League celebrates its 50th World Series. ■ Little League’s first full-service regional headquarters outside the U.S. opens in Kutno, Poland. ■ Little League debuts it’s Child Protection Program. This initiative expands and organizes safety-based initiatives for local leagues and includes background checks for volunteers. ■ U.S. regional championship games are televised nationally on ESPN2 for the first time. ■ Little League begins a capital campaign to raise $20 million for a variety of projects. ■ Construction begins on Little League Volunteer Stadium, allowing the Little League Baseball World Series to expand from eight to 16 teams in 2001. ■ Little League Baseball and ESPN agree to a six-year deal, worth more than $7 million, to carry Little League World Series games. ■ Little League International personnel construct a special field on the South Lawn of the White House. Three games are held on the field, with a fourth scheduled game postponed due to the terrorist attacks of Sept. 11. ■ The printed version of the “Little Leaguer” newsletter is replaced with an electronic version distributed monthly via email to more than 400,000 Little League managers, coaches, league officials, parents and players. ■ Little League and ESPN sign an eight-year television contract, worth $30.5 million, for coverage of all 32 Little League World Series games on one of its TV networks, and to expand the coverage in all eight Little League divisions. ■ Little League Baseball and Youth Sports Live sign a deal to stream all non-televised tournaments for a subscription fee. ■ Video replay is expanded at the Little League Baseball World Series. ■ ESPN 3D airs the Little League Baseball World Series for the first time. ■ The ESPN family of networks televises all four World Championship games in Little League Softball, and the semifinals of the Little League Softball World Series. ■ Davie Jane Gilmour is elected chairman of the Little League International Board of Directors, becoming the first woman to hold this position. ■ Little League and ESPN agree to an eight-year extension worth approximately $76 million through 2022.